ABOVE: The M/V Silver Whisper is a small ship by today's standards, carrying 382 passengers in 194 outside suites. Size and layout. The M/V Silver Whisper is the newest vessel in Silversea's four-ship fleet. It began service in July, 2001, joining its sister ship, the Silver Shadow, and the slightly smaller Silver Cloud and Silver Wind. With a length of 610 feet (186m), a width of 82 feet (25m), and a tonnage of 28,258, the Silver Whisper is considerably smaller than the "megaships" of many rival cruise lines. Yet because it carries only 382 passengers, compared to several thousand for today's largest cruise ships, its space-to-passenger ratio is the highest in the industry at 74 tons per guest. The ship never feels crowded even when it's traveling with a nearly full load of passengers, as it was on our Athens-to-Rome cruise. Like Silversea's other ships, the Silver Whisper has an unusual deck configuration. On decks with staterooms, all public rooms are in the aft section of the vessel, with passenger accommodations located midship or forward. This minimizes noise and traffic in the stateroom corridors while making it easy to move among the public areas by stairwell or elevators. Decor. The Silver Whisper's decor is the most attractive we've encountered on a ship in 40 years of ocean travel. For the most part, it could be described as simple but elegant, with extensive use of hardwood paneling and fixtures throughout the ship. The overall feel is reminiscent of a classic European liner from the 1930s, with an emphasis on comfort instead of glitz. The traditional ambience carries through to the open decks, which are clad in teak (except for the jogging track) and furnished with teak deck chairs and tables. Amenities. The Silver Whisper lacks some of the amenities offered by larger vessels--you won't find a climbing wall or an ice-skating rink, for example--but it's well-equipped with restaurants, lounges, bars, a spa, a small gym, an outdoor swimming pool with hot tubs, three launderettes, two shops, a computer room with Internet access, and a small library with videocassettes and books (mostly bestsellers, with many books available in large-type editions). On our cruise, which took place in the Mediterranean during the traditional European holiday month, the passengers came from 21 countries, with just over half from the United States. (See table.) At least two dozen children and teenagers were on board, and one couple traveled with a baby. Baltic and off-season cruises tend to draw an older crowd. 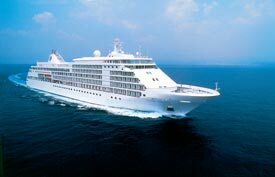 However, Silversea's average passenger age is dropping as its ships offer more 7- to 10-day cruises for working couples who can't leave their offices or children for extended periods.